We pleased to announce our 2019-20 season, a delectable assortment of concerts with music from the 8th to the 18th centuries, from Sequentia’s diverting and witty Charms, Riddles and Elegies to Peter Sykes’ Byways and Backwaters: German Harpsichord Music Not by Bach! Subscriptions go on sale May 15 and single tickets mid-July. Sunday afternoon concerts at 4 p.m.
Thursday evening concerts at 7 p.m.
April 2: Peter Sykes—Byways and Backwaters: German Harpsichord Music Not by Bach—Works of Mattheson, Krebs, Graupner, Böhm, Marpurg, et al. 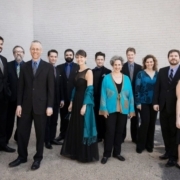 Blue Heron has become the first non-European ensemble to win the Gramophone Award in the early music category, marking a milestone in the award’s 41-year history. The prize recognizes Blue Heron’s recording Music from the Peterhouse Partbooks, Vol. 5, a piece of music traced as far as 1540, when it was copied for Canterbury Cathedral. Gramophone called it “one of the discoveries of the year. Visit The ARTery for further information on the award. Blue Heron performs at Music Before 1800 on February 10. Vox Luminis, (at MB1800 on October 28), and Blue Heron (February 10) have been shortlisted for 2018 Gramophone Awards. Vox Luminis is shortlisted for the recording Ein feste Burg ist unser Gott, released on Ricercar, and Blue Heron for the fifth volume in its Peterhouse series. For more information, visit the Gramophone website.